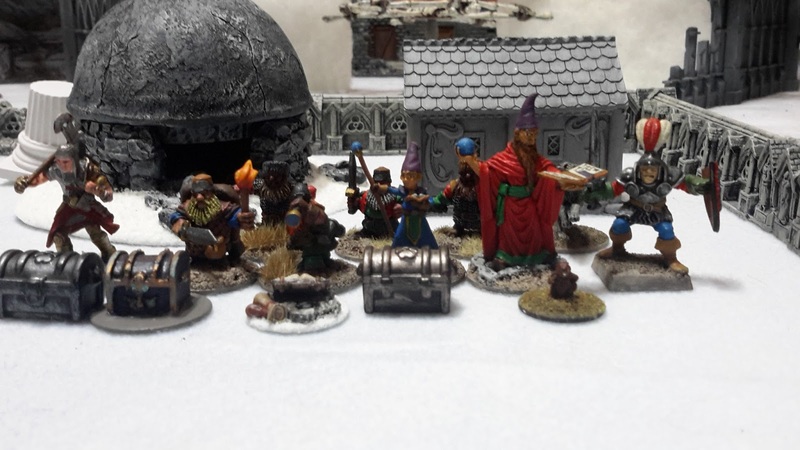 Frostgrave Campaign Game 10 – The Bone Wheel Goes Round and Round | H.A.W.K.S. 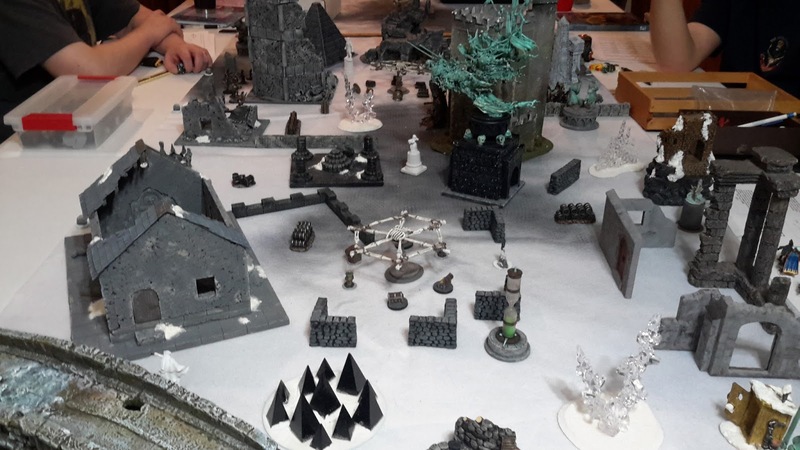 Two weeks ago we played game 10 of our 2017 Frostgrave campaign, the Bone Wheel from the “Thaw of he Lich Lord” scenario book. We had six of our regulars in attendance. The table was set-up with three bone wheels spaced across the center of the table. All the treasure was placed on the bone wheel meaning the warbands would have to move to the center of the table. The bone wheels would block line of sight and we deemed the treasures could not be moved by Telekinesis. We drew for starting positions and I choose a corner spot to reduce how many wizards I’d have to deal with. With full coffee cups and warm dice, we settled down to play. The last foray into the frozen city was a great success. 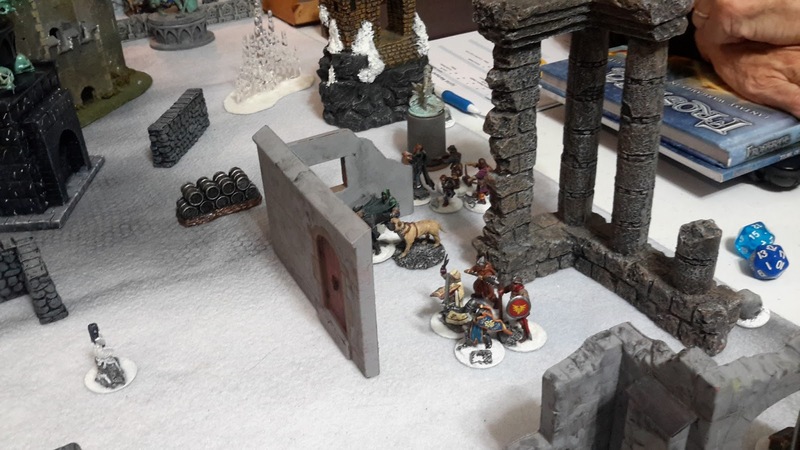 The warband had gained a lot of loot and had thwarted the Lich Lord’s latest scheme. But Bemis knew the evil one was not finished. The rumors of people disappearing persisted. 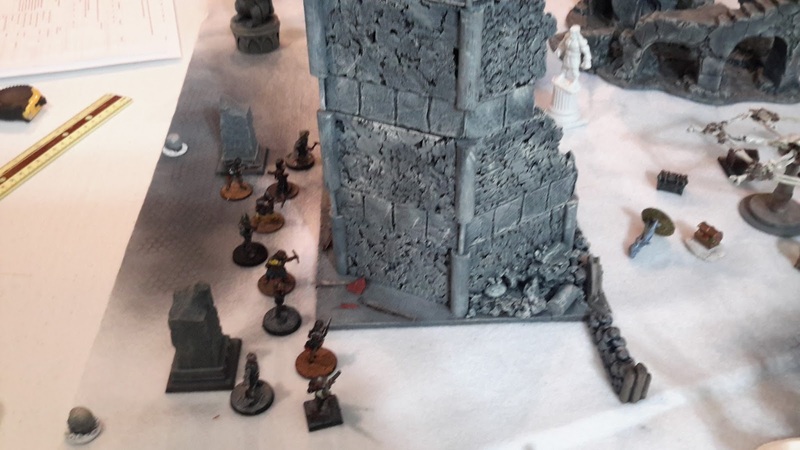 Another trip into the ruins was in order. 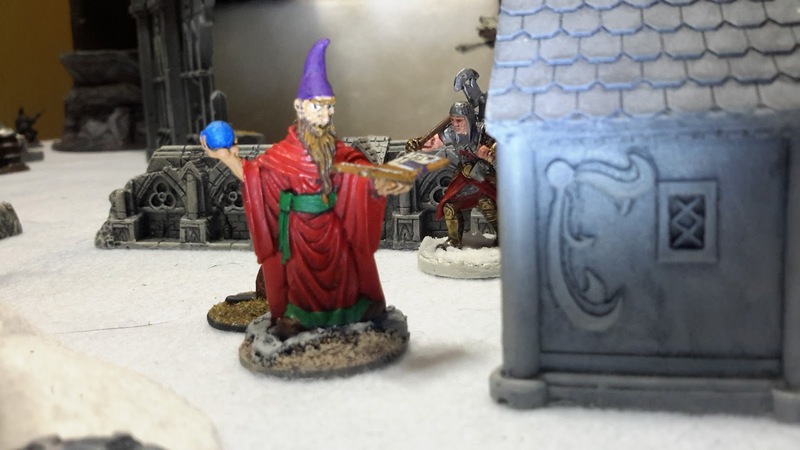 Bemis sent Nigel to visit the local taverns that Sir Cardidil the Knight (from Quail’s warband) frequented to spread word about the Lich Lord’s activities. Nigel returned, successful in contacting the knight. He immediately began to prepare the lads. Bemis and Agarn sat down at the scriptorium and spent some time transcribing the spells Transpose and Dispel (Successful casting of Write Scroll by both). They then turned their attention to their firing up the Cauldron of Brewing. The two spellcasters focused hard on successfully brewing two Potions of Invisibility (Bemis and Agarn successfully cast Brew Potion). While using the cauldron to brew a potion, Bemis thought of the other cauldron his warband had recently recovered. Even though it had been scrubbed out several times, the large pot still reeked with necromantic magic. Bemis knew he would have to destroy it soon. Bemis was successful in calling forth his familiar (a beaver), Agarn failed to summon his creature. Bemis let his familiar go play in the small pond out back while he climbed to stairs to his observatory to peer through his Celestial Telescope. 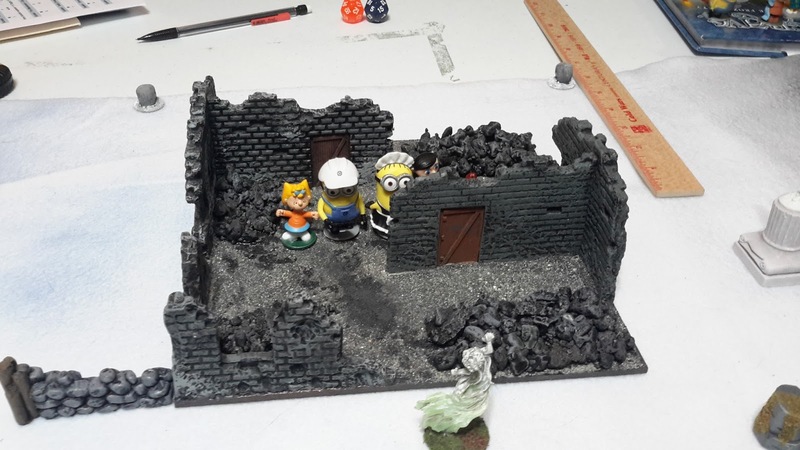 He hoped he might gain some insight before their next foray into the ruins. As he concentrated, he was able to perceive a great treasure was hidden inside an ancient burial hut. The hut appeared to located near their intended search area. Being as prepared as he could be, Bemis headed off to get some sleep. The morning would come soon enough. The next day proved to be cold but clear. Not a cloud in the sky. 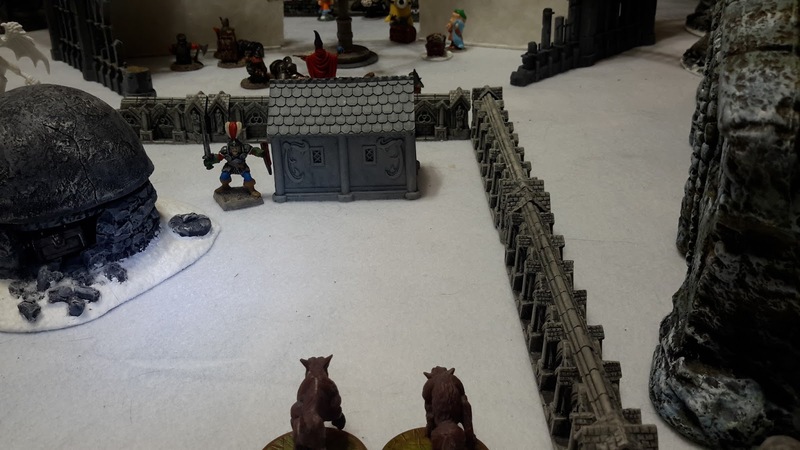 As his warband stood around waiting to get started, Bemis told Agarn about the burial hut. “It will be your job to explore it and see what you can find” he relayed to his young protege. With that accomplished, Bemis asked Nigel to lead them out. As the warband approached their destination, Bemis could sense a lot of magic energy in the air. He could detect faint traces of several other wizards moving through the ruins; including his fellow Sigilist Quail. 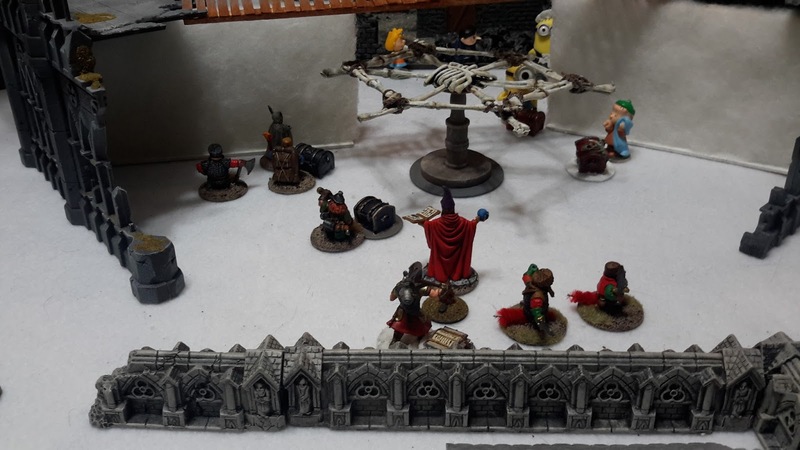 Bemis immediately cast Fog to cover his warband as it moved forward to investigate the strange wheel that appeared to be constructed of hundreds of bones. Looking closer, Bemis could see there were several bodies hanging from the structure. “What foul evil is this” he thought as he waved his warband forward. As he moved closer for a better look, he rounded a wall section and found himself staring at the faint outline of an incorporeal apparition floating a foot or so above the ground. As it moved, it passed right through a stone wall. Bemis had read about such horrors but thought they were the ravings of lunatic minds, the things of myths and legends. But here in front of him was proof of their existence. Agarn, seeing some strange yellow creatures moving around on the far side of the bone wheel, emulated his Master and cast Fog to provide additional cover. A horrid bone chilling scream pierced the morning mist. 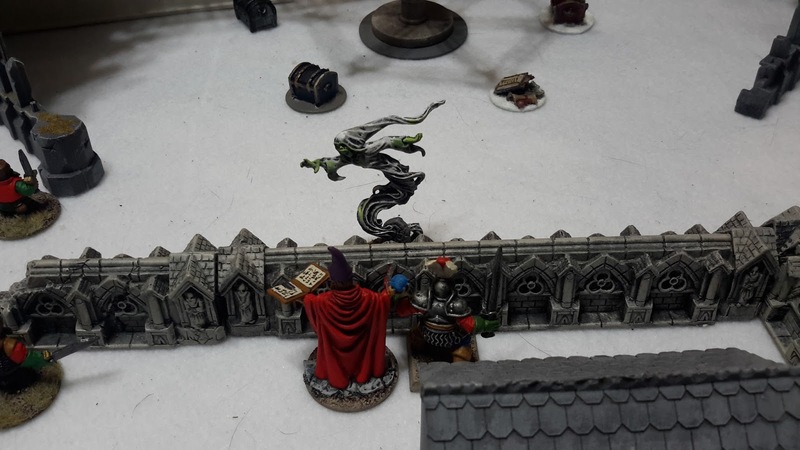 Another banshee was loose in the ruins (and attacking Saffarn’s warband). Bemis attempted to cast Strength. He must have been still rattled by the encounter with the banshee as he doesn’t even come close to incanting the correct words and ends up with a slight nose bleed (suffered a point of damage for miscasting). Agarn cast Drain Word – Elemental Dart. 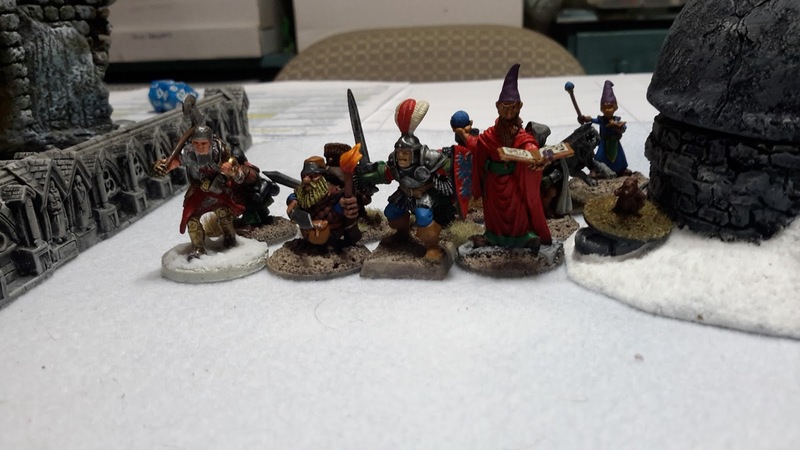 Bemis’ warband gathers treasures from the bone wheel. 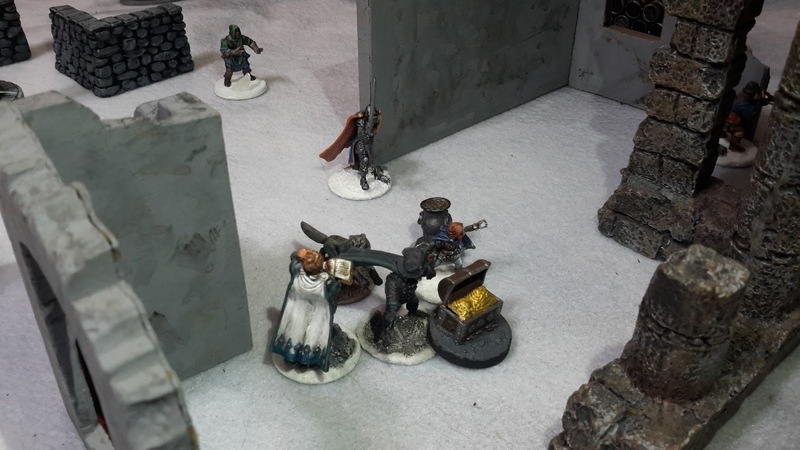 Vale, 9Toe, and Diesel reach the bone wheel and quickly cut down three bodies hanging on the wheel. They notice two things. First, all three bodies are still alive, just barely. And second, they all had pouches around their neck that must contain some gold since they jingled when touched. They heard some movement on the other side of the bone wheel. The strange yellow critters have moved closer. They quickly grab the three pouches and start to back away as Hatch and Kleppo move up to provide them some support. If the yellow creatures come through the fog, they will pay dearly. Nigel saw a threat to Agarn in the form of two wild dogs emerging from the ruins; he moved in that direction. The two dogs, wild eyed and snarling, leapt at Nigel. Nigel met their attacks by blocking one with his sword and impaling the other with his dagger. Agarn cheered the old sword master. Now the odds were even (10 points xp for Nigel). Niko and Piko decide to move towards what looks to be another bone wheel in the distance. Shadow sees them move off. Barking happily, he bounds ahead of them as he sees some ducks flying through the air (Alfred the Unready was using Leap to extract his minions carrying treasures much to Quail’s dismay). 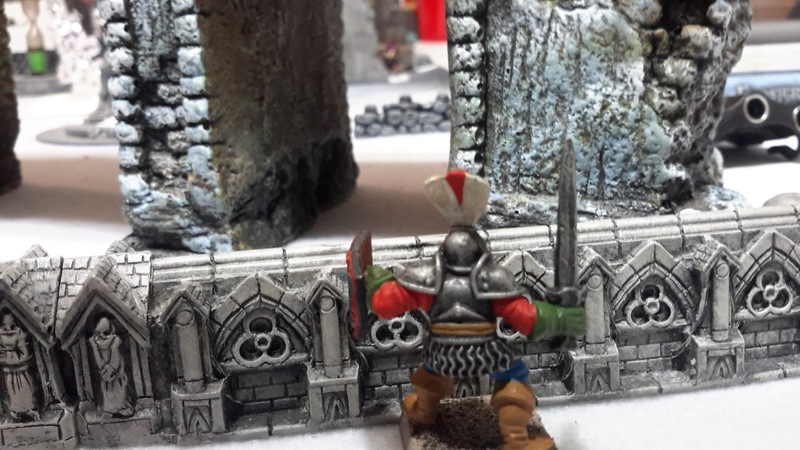 As he stumbled backwards, Bemis noticed someone lurking in some nearby ruins. He quickly pulled out a feather and cast an enchantment on it (successfully cast Furious Quill). He then threw it towards Quail’s ranger. Unfortunately the feather did not fly straight and tumbled to the ground (The ranger resisted the spell). 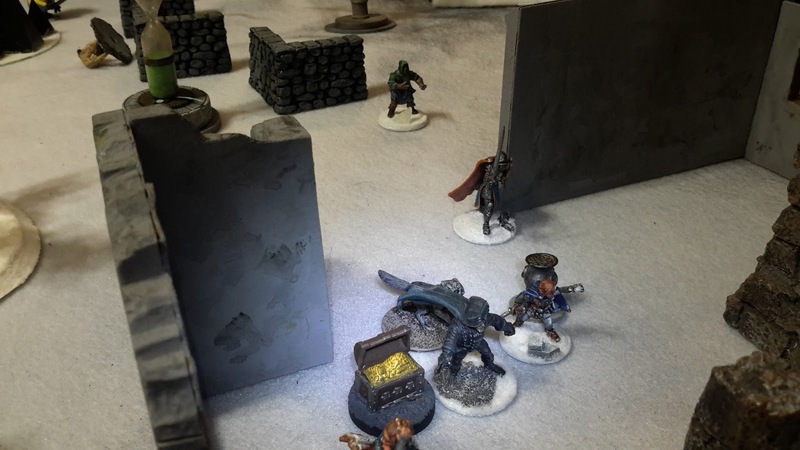 Niko and Piko continued their friendly and peaceful movement towards Quail’s warband, their eye on a treasure chest laying in the ruins of what appeared to be an old tavern. Shadow caught up with Quail’s treasure hunter, playfully nipping at his heels looking for a Scooby snack. 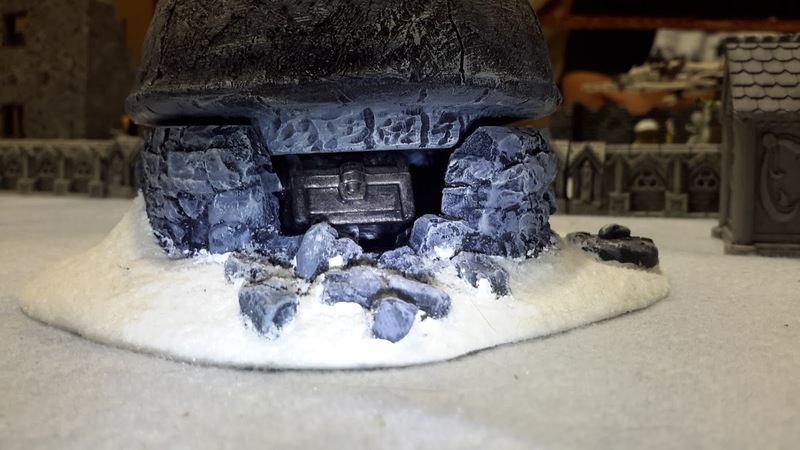 Agarn roots around in the burial hut and finds a small chest. He places it in his backpack and heads towards Nigel. Bemis again successfully cast Furious Quill on Quail’s ranger. The feather flew straight and true but fell short of it’s target. 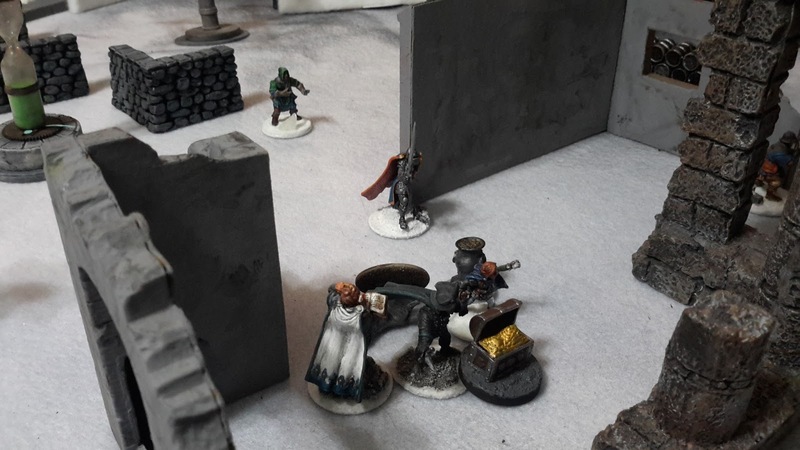 Over to the right, Bemis heard Quail yell “Run boys and girls” as she pulled up her robes and disappeared into the ruins (retreated off the board). Agarn cast Drain Word Leap, cancelling out Drain Word Elemental Bolt. Niko and Piko charged into combat with Bailey – “Revenge for Agarn” they yelled. 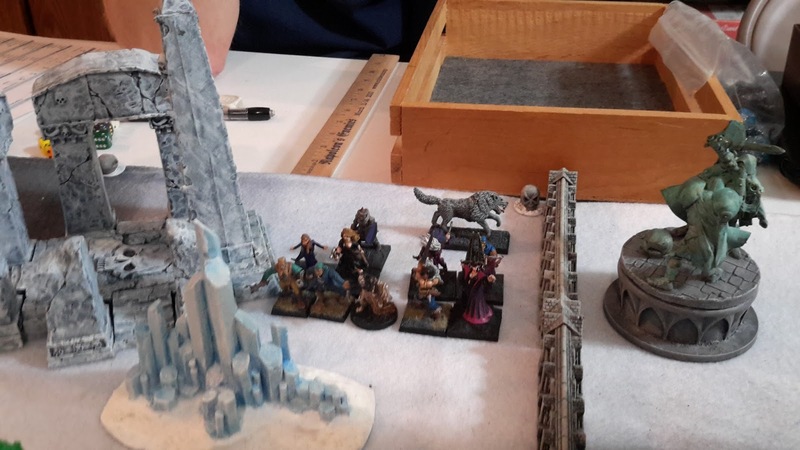 After whacking on her on the bottom with the flats of their swords (causing 8 points of damage), they quickly withdrew chuckling to themselves, “You should have seen her face, priceless”. As they returned to the warband, Nigel gave them a good dressing down for leaving the warband and picking on the young girl. And with that, Bemis rallied his warband and burdened with four treasures, they slowly departed the ruined city. Back in cozy warmth of his library, Bemis looks through the day’s haul: 20 gold coins and a Ring of Will, 60 gold coins and a Fate Stone, 100 gold coins and a grimoire (Combat Awareness), and the box Agarn recovered from the burial hut. Bemis cautiously opened the lid. Inside was an ornately decorated horn. After studying the runes carved on the horn, he concluded this was the a legendary Horn of Hellfire, thought to have been missing for at least four centuries. It should come in handy. As usual, Bemis then retired into his reading room to decompress from the day’s activities by studying some of the arcane tomes (successfully cast Absorb Knowledge). 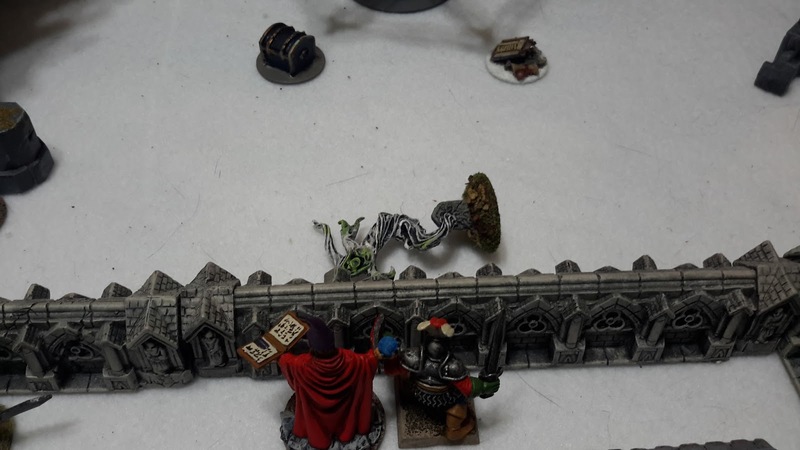 Total experience: 8 spells successfully cast for 80 xp, killed a banshee for 20 xp, Bemis touched the bone wheel for 20 xp, 4 treasures recovered for 200 xp, and Absorb Knowledge for 50 xp = 370 xp. With this latest adventure, Bemis has surpassed the great and infamous Druid wizard Knabe in levels. Nigel gained 50 xp which brings his Captain xp to a total of 380. This was a another great game. The banshees seemed to die pretty easily and were not much of a threat. 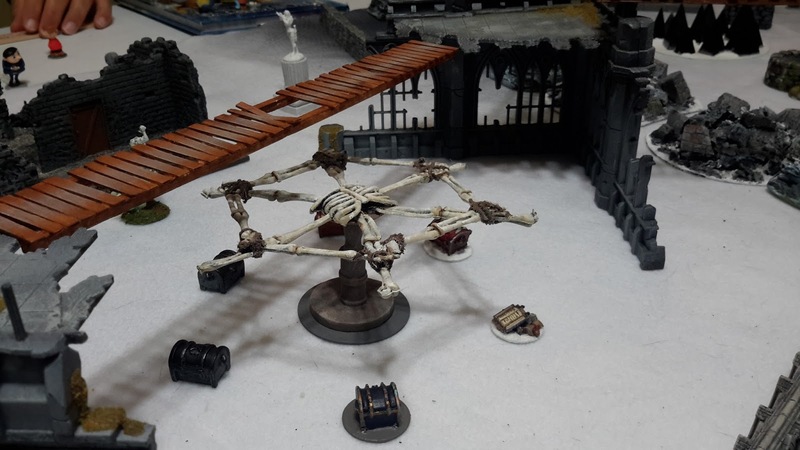 The treasure on the bone wheels was grabbed quickly before they even got a chance to rotate. 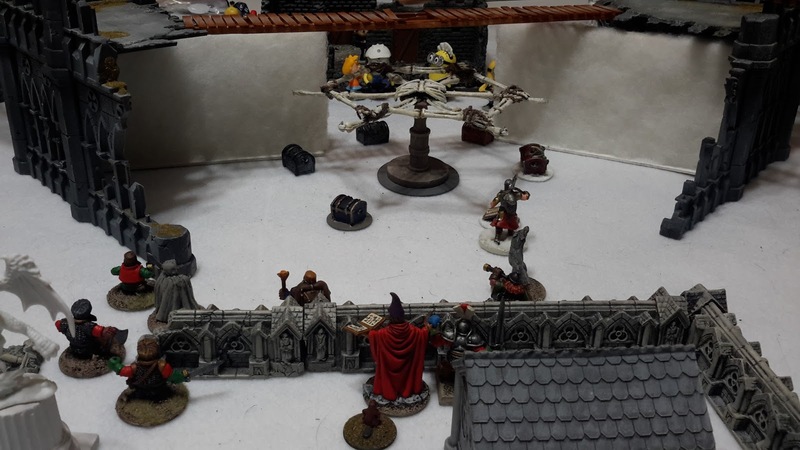 Once treasures were grabbed, everyone looked to the center of the table and decided to make an attempt to intercept either Quail’s or Alfred henchmen as they carried away treasures. No one was successful in doing so but is was a little funny seeing the two scramble to escape. I saw it as pay back for Quail attempting an end run against my unguarded Reveal Secret treasure several scenarios back – All in good fun. That bone wheel is really cool!